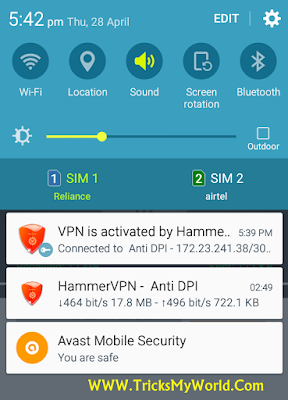 Hammer VPN Trick for Airtel: Here we are sharing Airtel 3g free internet trick for Android users with Hammer VPN. This is an android app like DroidVPN. This app gives you daily 100MB to 150MB free Airtel 3g internet data with high speed. This 100mb free internet works with 0 balance that means no need any data pack. You can download Play Store apps, games, music and watch youtube videos and Gmail, Google Maps also supported fine like normal Airtel data pack. So you can enjoy Airtel high-speed internet with 3g or 4g network. 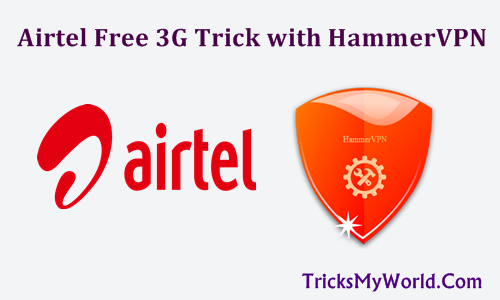 How to use Airtel Free Hammer VPN 3G High-Speed Internet Trick? and How to make hammer VPN settings? Just follow below steps. Done, Enjoy Airtel 100MB free 3g internet on your android mobile. The Airtel free internet trick is working fine us in Tamil Nadu. This trick is currently working in almost all states in India. If this trick works fine you then please comment below with your state name. You can see below free internet working proof. We hope that this hammer VPN airtel trick is working fine to you. If you have any problem or doubt then please comment below. Share this tricks to your friends on Facebook, Twitter, Google+. I can't believe this trick is working like a charm! Super ! I will tell your site to all my friends! This trick not working now in kerala please fix the error. Is this trik still working? I'm gonna try it. Thx for sharing. Surely a nice trick mate. Working good. But the speed is quite slow in my area. When you try to use more than 100mb/day then Airtel will block your sim card (Only free internet like using VPN and proxy). There are many methods available to unblock so you can check out on the internet. If you want to browse the unlimited internet with hammer vpn then you need to purchase a premium account. Just go to one.airtel.in (or) airtelgurus.com, If the link working fine to you then your airtel sim not blocked. If not working then your sim card blocked. Because your sim card blocked by Airtel. Is this trick work in srilanka?